There's a particularly addictive type of chevre (goat cheese, en francais) at Trader Joe's that my friend Jodi turned me onto recently. You TJ's addicts have probably already tried it: the Chevre with Honey. It's pure creamy bliss with just the slightest hint of honey sweetening the tartness of the goat cheese. Great on crackers or bread, or just straight out of the package, most cheese fans will agree that this is a delectable little treat. For me it's just a bit too rich to enjoy straight or even on crackers (one 8 oz. package could last me about 2 weeks) but when I first had it, it occurred to me that it would make a fabulous base for a dessert. Almost immediately I thought of it as a great alternative to cream cheese for a nice cheesecake. And since it's scary week and I don't have much in the way of baking essentials, I figured it'd be fun to experiment with a no-bake chevre cheesecake concoction that I could throw into a shot glass for a new Dessert Shot. Some of you who tried the Banana Caramel Parfait Shots have written to me letting me know that it is, indeed, just the right amount of dessert after any meal (and how sinfully rich it was!). I'm glad to see people agree with me! Don't get me wrong, I love my dessert and would eat a Grand Marnier Souffle the size of my refrigerator if I could, but only if that was all I was eating for a week. Sweet, after-dinner treats ought to be small (the serving, not the entire dessert) not only for the waistline's sake but because the stomach is usually not done registering fullness after a meal; adding a huge dessert at the end of a big meal can only cause misery afterwards. As I mentioned in my previous dessert post, many restaurants are finally starting to pare down the size of their desserts, probably more as a marketing ploy to get the dieters to indulge a bit. Still, when it comes to cheesecake, traditional serving sizes have always been rather small, mainly due to its richness. I've never seen a slice of New York Cheesecake bigger than a small sliver, and rightly so! Such a dense, rich dessert should be eaten in small quantities. That being said, I have a couple things to note about this recipe. Do not expect this to taste exactly like cheesecake because it's not. Still, its creamy, rich texture will make you think of a delicious cheesecake filling with the interesting bite that comes from goat cheese. Because the flavors are sharper and more distinct, using a chocolate "crust" enhances the dessert more than a traditional graham crust would, and what easier way to make this than with Oreos? Lastly, though I used frozen berries in this recipe, feel free to use fresh ones if you're lucky enough to have them around right now! That will only make this more delicious. And now for the recipe. Prepare your "crust" by pulsing the Oreos (cream and all!) in a blender/small food processor and pulse until you have a coarse powder. Set aside. Place the frozen berries into a large bowl with 2 T of sugar and allow to thaw. The sugar will allow the berries to release their juices and create a sort of "syrup" that will be the flavor base for this dessert. When the berries are mostly thawed, use a hand blender to puree well (if some slightly frozen bits remain, that's okay). In another bowl, use an electric mixer to whip the chevre and remaining 2 T until it becomes smooth, with an almost frosting-like consistency. Add 4 T of the berry puree and mix into the chevre until it becomes a light pinkish mauve in color. Add more if desired but be careful not to add to much so that you don't end up with a runny cheesecake base. Assemble several shot glasses together (or small juice glasses if that's all you have, though these will be larger desserts) and add about 1 t cookie crust on the bottom of each glass. 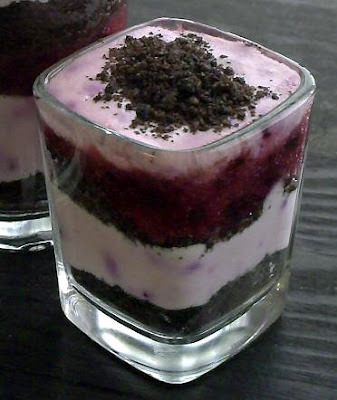 Add about 1 T cheesecake filling, another layer of cookie crust, then 1 t berry puree, and so on and so forth until you have filled each glass. Your last layer should be of the cheesecake mix so that you can dust a nice sprinkle of cookie crust on top for a nice contrast. Chill in the fridge for about an hour before serving, and enjoy! I love serving dessert in shot glasses! It is just the "little something" you need after a meal. Trader Joe oreos are a thousand times better than the real ones! Plus, if you got those then the all of the ingredients would be from one place. I have a multitude of berries in my possession so I'm gonna try this soon with a slight modification! Cream cheese and graham crackers!